This natural source of vitamins A and D fell out of favor after World War Two but is now making a big comeback. We find out why and explore the new choices for adding cod liver oil to our daily diet. Although liver is the most nutrient-dense food on our planet it’s not exactly everyone’s favorite dish. So Certified Natural Chef Carla Delangre shows us an easy way to incorporate this nutritional powerhouse into a favorite sandwich. Dr. Howard Murad, an expert on cellular health, explains why it’s not only possible to slow down the aging process it’s also possible to reverse some elements of aging via a method he calls Youth Building. One thing that keeps us young is having a healthy supply of energy so author and Healing Quest co-host Michele Bernhardt shares her perspective on how to value and feed this critical element of life. Along with taking care of our energetic body we also need to take care of our spirit. In this segment spiritual life coach Kevin Kitrell Ross gives us some guidance for how to nourish our spirit. Psychologist and Healing Quest co-host Dr. Brenda Wade explains how to practice gratefulness and why doing so can deliver such big benefits. Cinematographer David Fortney gives us an unforgettable view of the natural beauty that surrounds us. 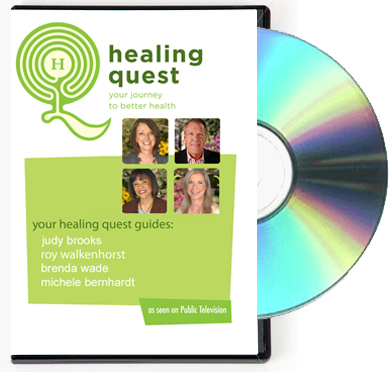 Be the first to review “Healing Quest: Episode #1007” Click here to cancel reply.